Dynamic changes are underway in American higher education. New providers, emerging technologies, cost concerns, student debt, and nagging doubts about quality all call out the need for institutions to show evidence of student learning. From scholars at the National Institute for Learning Outcomes Assessment (NILOA), Using Evidence of Student Learning to Improve Higher Education presents a reframed conception and approach to student learning outcomes assessment. The authors explain why it is counterproductive to view collecting and using evidence of student accomplishment as primarily a compliance activity. Today's circumstances demand a fresh and more strategic approach to the processes by which evidence about student learning is obtained and used to inform efforts to improve teaching, learning, and decision-making. Whether you're in the classroom, an administrative office, or on an assessment committee, data about what students know and are able to do are critical for guiding changes that are needed in institutional policies and practices to improve student learning and success. Gauging student learning is necessary if institutions are to prepare students to meet the 21st century needs of employers and live an economically independent, civically responsible life. 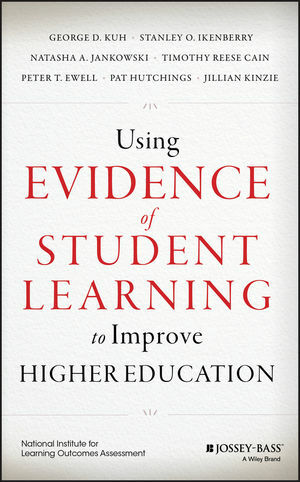 For assessment professionals and educational leaders, Using Evidence of Student Learning to Improve Higher Education offers both a compelling rationale and practical advice for making student learning outcomes assessment more effective and efficient. GEORGE D. KUH is director of the National Institute for Learning Outcomes Assessment (NILOA) and coprincipal investigator at the University of Illinois. STANLEY O. IKENBERRY is coprincipal investigator at the University of Illinois. NATASHA A. JANKOWSKI is assistant director of NILOA and research assistant professor at the University of Illinois. TIMOTHY REESE CAIN is a NILOA senior scholar and associate professor in the Institute of Higher Education at the University of Georgia. PETER T. EWELL is a NILOA senior scholar and vice president of the National Center for Higher Education Management Systems. PAT HUTCHINGS is a NILOA senior scholar and consulting scholar for The Carnegie Foundation for the Advancement of Teaching. JILLIAN KINZIE is a NILOA senior scholar and associate director of the Center for Post-secondary Research at Indiana University.